In fulfilling that mission, Emory faculty, staff, and students commit to seeking a more just and sustainable future for all. I am proud of everything we have accomplished together this past year, and I eagerly anticipate the advances that lie just around the corner. In this report, you will find stories of our impact in the classroom, in the clinic, in Atlanta, and in the world — a slice of the transformative contributions that the people of Emory make every day. Discovery feeds a never-ending quest for knowledge. From cutting-edge medical breakthroughs and scientific advancements to groundbreaking scholarship and scholarly writing that attracts national headlines, Emory thrives on discovery. And those discoveries are happening everywhere. From Emory’s Stuart A. Rose Manuscript, Archives, and Rare Book Library, where students can peruse a collection of personal letters written by former US President Barack Obama, to the Emory Vaccine Center, where researchers are exploring how frog slime can kill the flu virus, our faculty and students are deeply engaged in an ever-expanding quest for new insight and knowledge. That journey helps create a rich intellectual arena, fed by faculty expertise and the engagement of promising student talent. At Emory, discovery finds many creative pathways, from using imaging technology to reconstruct the brain architecture of an extinct tiger to research into how governments confront the challenge of contagious diseases or how hormonal changes help fathers bond with toddlers. It’s top-flight scholarship that increasingly claims international attention, receiving some of the world’s most prestigious research awards, fellowships, and grants, which in turn nurture advances both enlightening and exciting. Letters from President Barack Obama to his college girlfriend, now part of the collection of Emory's Rose Library, reveal a young man grappling with his place in the world. Emory anthropologist Jessica Thompson's work in Malawi is part of a major new paper filling in thousands of years of human prehistory of hunter-gatherers in Africa. A component of the skin mucus secreted by South Indian frogs can kill the H1 variety of influenza viruses, researchers at Emory and in India discovered. Emory researchers explore how dads bond with toddlers, including gender biases that can be seen in both brain responses and behaviors. "Brotherman" debuted in 1990 as one of the first comic books to feature a black hero. Almost three decades later, Emory's digital scholars reimagine the text as an immersive, virtual reality world. Chemistry professor Francesco Evangelista won the 2017 Dirac Medal, one of the world's most prestigious awards for theoretical and computational chemists under 40. Law and global health professor Polly J. Price is a recipient of the 2017 Andrew Carnegie fellowship, which comes with up to $200,000 to fund research in the social sciences and humanities. Hands-on learning transforms the student experience. Working in a laboratory, an Emory undergraduate strives to discover if blackberries hold the key to battling antibiotic-resistant infections — hands-on research that builds upon the findings of his faculty mentor. Across campus, Emory students learn about global security and immigration challenges from the director of field operations for US Customs and Border Protections in Atlanta — part of a course that mirrors dialogue now taking place in the nation’s capital. At Goizueta Business School, a $3.5 million endowment from the Delta Air Lines Foundation breathes life into an experiential peer-to-peer education initiative that will provide students the coaching and opportunity to grow as leaders. Through challenging courses, service-based-learning opportunities, and firsthand community engagement, Emory students are finding exciting new pathways to knowledge — the hallmark of a top liberal arts research university. Working with the guidance of a world-class team of faculty mentors and researchers, our students are not only advancing knowledge; they’re already making their mark on the world. Emory College senior Chelsea Jackson will study in England as a 2018 Rhodes Scholar. Get to know her and other Emory students who were honored with prestigious scholarships this year. Emory is one of the first major research universities to completely overhaul how it teaches chemistry, from introductory courses to capstone senior seminars. Strengthened by award-winning faculty and emerging student talent, Emory's Creative Writing Program is consistently cited as one of the best programs in the nation for undergraduates. A $3.5 million gift from the Delta Air Lines Foundation to Goizueta Business School will endow the Delta Leadership Coaching Fellows Program, an experiential education initiative, and support the Delta Leadership Hub, a teaching and reception space at the school. The Summer Undergraduate Research at Emory program, or SURE, provides students with 10 weeks of full-time, mentored, independent research working directly with professors in disciplines from philosophy to psychiatry. Through innovative research, patient care, and teaching, Emory is changing the face of health care. Across the health sciences, Emory is a game changer, pioneering new ways to prevent and treat diseases and leading the way for the next generation of health care professionals while providing the highest quality in clinical care. Advancing a mission built upon excellence, caring, and integrity, Emory is addressing some of the world’s most pressing health care challenges. In 2017, that meant life-saving breakthroughs in cancer care, a landmark study in stroke treatment, promising insights into reversing the ravages of Huntington’s disease, and a novel discovery into how fire ant venom may be used to help treat psoriasis. Today, these kinds of research advances are finding more support than ever before. During the 2016–2017 fiscal year, Emory researchers received a record $628 million in external funding — the largest amount in the history of the university. The result? Research projects are changing the outcomes for diseases, improving drug regimens, providing insight into the impact of environmental toxins, and unraveling the mysteries of neuropsychiatric conditions. With life-changing research and life-saving care, Emory responds to medical challenges felt across the globe. In 2017, Emory's Winship Cancer Institute observed its 80th anniversary with a milestone accomplishment — designation as a National Cancer Institute Comprehensive Cancer Center, placing it in the top 1 percent of all cancer centers in the U.S. In Georgia, it is the first and only cancer institute to receive the honor. Emory University researchers received $628 million from external funding agencies in fiscal year 2016-2017. This marks the eighth consecutive year that research funding has exceeded $500 million, and with an increase from $574.6 million in FY16, it is the largest amount of research funding in Emory's history. Here in Georgia and around the world, Emory researchers are working to improve diabetes detection, prevention, and care, especially for those most in need. In the first human clinical trial, small skin patches with dissolvable microneedles were safe and well-tolerated, generated robust immunity against influenza, could be self-administered by study participants and were strongly preferred over shots. For three consecutive years, Emory's Nell Hodgson Woodruff School of Nursing has ranked among the top five nursing schools in the U.S. for research funding from the National Institutes of Health. Alzheimer's and Parkinson's aren't the same, but at the biochemical level, these two neurodegenerative diseases start to look similar. Scientists at Emory are exploring new possibilities for treatment and care-giving. By meeting head-on the challenges of today and tomorrow, Emory is changing lives. Discovery, inquiry, and creating new knowledge are academic drivers at Emory, where students and faculty are challenged to engage with some of the world’s toughest questions in novel ways every day. But it’s what they do with that knowledge, how they rise to those challenges, that makes a difference. Even as our researchers and budding scholars are exploring questions and discovering solutions, they are pushing boundaries and finding answers to real-world problems. With a strong tradition of community engagement and service-based learning, Emory is reaching out to neighborhoods, cities, communities, and countries around the world, making an impact and making a difference. Whether demonstrating new green technologies on campus, reaching out to help with hurricane relief, developing programs that teach compassion to doctors across North America, connecting faith communities through interfaith dialogues, confronting the opioid addiction crisis, or working to eliminate human trafficking, Emory works tirelessly to make a difference. From an award-winning WaterHub facility to an ambitious, new waste management policy, Emory is conserving resources and energy as part of its 2025 Sustainability Vision. An Emory-cultivated program focused on teaching doctors and medical students to be more humanistic and compassionate at the bedside has now become part of the curriculum at 30 US and Canadian medical schools. For 35 years, Emory University and The Carter Center have partnered to improve the lives of people in need around the world. University faculty, students, and advocates are confronting the complicated crisis of human trafficking by conducting research, establishing campus organizations, and advocating for change. Candler School of Theology's Laney Legacy in Moral Leadership program hosted a series of events about moral injury, the emotional and spiritual pain that can afflict soldiers and others who are asked to perform actions that run counter to their moral codes. With a track record of courageous, dogged research, Emory leads the way in meeting the world's challenges. You can't stop infectious diseases, species extinction, or global climate change at a border. That's why Emory scholars and students are actively reaching beyond them in search of breakthrough solutions to some of the world's toughest challenges in medicine, public health, social policies, and the environment. Hundreds of Emory faculty conduct research with impact around the world, in the sciences and the humanities. And with research partners in more than 159 countries, our faculty are collaborating on topics with global reach, from HIV and Ebola to threats facing the pollinators that maintain our food supplies. Whether solving for pathogen outbreaks and pervasive diseases, the health effects of global warming, the impact of shrinking primate populations, or sustainable economic strategies, Emory is engaged in work that matters. That work places us at the epicenter of research and public service initiatives being felt everywhere, every day. Little wonder that our graduate and undergraduate students view the world as their classroom. With experience gained from study abroad exchanges and hands-on field research opportunities, they are helping chart the course for an increasingly interconnected world. The health effects of global warming are already being felt. Take an in-depth look at how researchers at the Rollins School of Public Health are addressing climate change on multiple fronts. The National Science Foundation has awarded another $20 million to Emory's Center for Selective C-H Functionalization, to fund the next phase of a global effort to revolutionize the field of organic synthesis. Founded 10 years ago as the flagship program to expand the university's commitment to health around the world, the Emory Global Health Institute channels resources to help those most in need. A new global engagement map documents nearly 1,000 Emory faculty members with global expertise, in disciplines ranging from health sciences and business to law, theology, and the liberal arts. 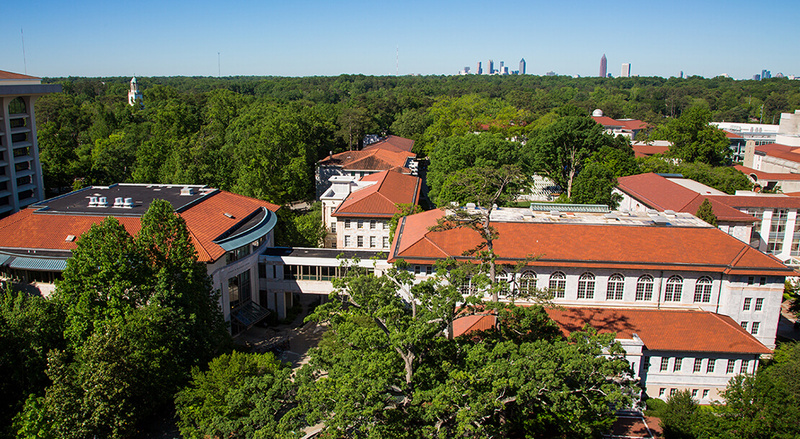 Through engaged scholarship, public service, and civic collaborations, Emory has always been connected to Atlanta. But this year the university took that relationship a step further, strengthening its longstanding partnership with the community by seeking official annexation into the City of Atlanta. In December 2017, the Atlanta City Council formally approved the move, which went into effect January 1, 2018, launching a new stage in the historic relationship and a renewed commitment to “serving the common good in the greater metropolitan area and beyond,” said Emory President Claire E. Sterk. It’s a relationship that has only grown stronger over the years. Today, Emory enjoys productive partnerships with other academic research institutions and engagement with the burgeoning Georgia film industry, Atlanta’s professional sports teams, regional business powerhouses and fledging startups, the city’s artistic and social service communities, a city-wide science festival, and far-reaching scholarship into the perils of climate change. An economic engine for the region, Emory has — through its research, community service, and health care — generated millions of dollars in local and statewide benefits. Our impact is felt by industries, neighborhoods, and individuals as we help solve some of today’s biggest challenges. Emory provides $9.1 billion in economic impact within the Atlanta region and Georgia, while supporting nearly 64,000 jobs and generating $200 million in state tax revenues. Emory Healthcare provides expert care to the Atlanta Hawks and the Atlanta Braves, including the opening of the Emory Sports Medicine Complex, home to the Hawks' official training facility. The bio-research partnership between Emory University and the Georgia Institute of Technology has produced biomedical discoveries for decades. Emory's HERCULES Exposome Research Center provides science to address environmental health concerns in metro-Atlanta communities. A five-year, $4 million project will evaluate motor vehicle crashes that result in injuries treated at Grady Memorial Hospital. The year 2017 brought remarkable milestones for Emory. From the inauguration of President Claire E. Sterk, the first woman to lead the university, to the opening of the new Emory University Hospital Tower on Clifton Road, the first major expansion of the hospital in years, it's been a transformative year of growth and change. New thinking was a guaranteed byproduct as Emory welcomed the appointments of top leaders, including a new provost, executive vice president for business and administration, and a Board of Trustees chair. In addition, new deans were named for both Emory College of Arts and Sciences and Emory School of Medicine. At the same time, the university embarked on the next critical phase of the strategic planning process, designed to align Emory’s strengths and opportunities in advancing its vision and mission for the next decade — in this process charting an exciting course for the future. In fact, take a stroll through the heart of Emory’s Atlanta campus, and you’ll see the future taking shape in a sprawling new Campus Life Center. Last year’s demolition of the Dobbs University Center has made way for a three-story complex that promises to usher in a new age of community building, collaboration, and connection for Emory students. But even as the campus looks to the future, last year was also a time for acknowledging just how far we’ve come. An internationally acclaimed public health researcher and Emory faculty member since 1995, President Claire E. Sterk is the first woman and first social scientist to lead the university. She is the university's 20th president. Applications for Emory University's undergraduate programs hit an all-time high, with a record-breaking total applicant pool of 24,114 students seeking to join the Class of 2021, an increase of 19 percent over last year. On Saturday, Aug. 26, the first inpatient was rolled into the new, 450,000-square-foot Emory University Hospital Tower. The $400 million hospital tower contains 232 patient beds, including 40 critical care beds. Emory celebrated two centennials in 2017, as the school marked the 100th anniversary of Emory Law and 100 years since Eléonore Raoul enrolled in the newly opened law school, becoming one of the first female students to earn an academic degree from the university. Michael A. Elliott, Asa Griggs Candler Professor of English, is appointed dean of Emory College of Arts and Sciences. Elliott previously served as interim dean of Emory College. Vikas P. Sukhatme, a distinguished physician-scientist, is appointed dean of Emory University School of Medicine. He also will serve as chief academic officer of Emory Healthcare and as Woodruff Professor.